Leaves, leaves, leaves, and more leaves. Everyone we talked to today had something to say about the leaves. The leaf hatch is in full swing for sure. With high winds and some snow hopefully it won’t be long before they are all off the trees and washed down stream. Even with all the leaves we had a great day. It wasn’t tons of bites at each stop. It was actually only 8 fish hooked all day. However, out of those 8 we landed 3 and they were all very good fish. One was actually the personal best for the Pavati and possibly for any guided trip I have done. We didn’t get a weight on him just a quick picture and he was released to fight another day. Today it was strictly a bead bite for us while we were float fishing. We also tried egg sacks but they wanted nothing to do with them. Our hot bead was a Great Lake Steelhead Company bead that I had doctored up a bit. We also took one fish on a chrome hotshot while back trolling one hole. That same hot shot took a good rip after that but didn’t hook up. Due to high winds we didn’t do much plug fishing today. It is not lights out fishing but it there are plenty of fish around and most of the fish we saw were big. I have some open dates in December if anyone wants to get in on the action. I will also be offering $50 off for the Months of January and February. 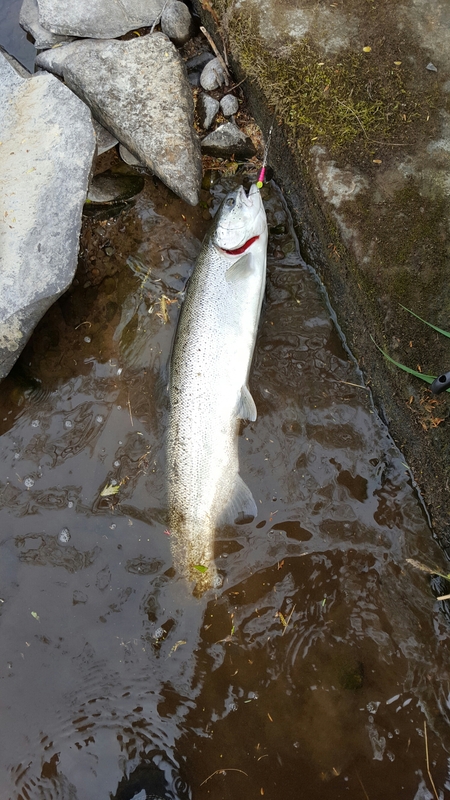 The fishing is very good for brown trout, king salmon, and steelhead. The lake has been producing good numbers of browns and kings out of Oswego. From what we are seeing so far the fishing this fall is going to be excellent on the river again. Charter captains are seeing good numbers of fish hitting the deck each trip out. The Walleye fishing at night has been excellent as well. I have some openings for Walleye trips. The Salmon River is still running at 350 cfs and has steelhead top to bottom. I floated Altmar to Pineville Monday evening and couldn’t believe the number of steelhead up that high still. There are also large numbers of small stocked trout. Try not to abuse these fish as they are the future of this fishery. We made a couple moves Monday because in some spots we couldn’t keep them off the hook. 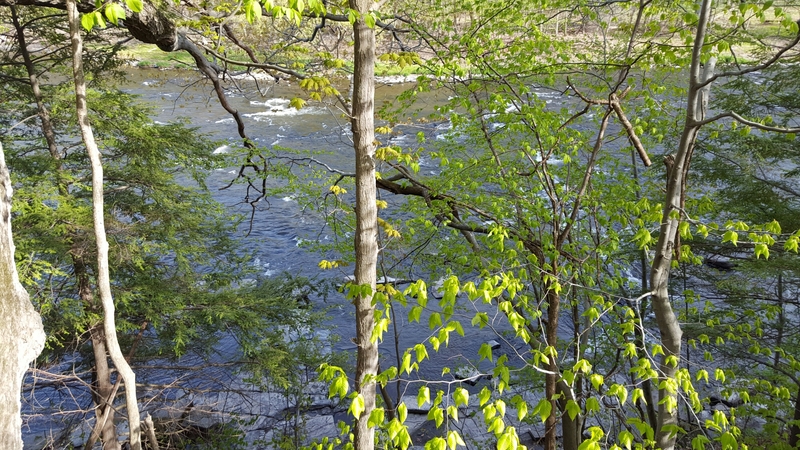 The smallies are starting to enter the river as well. A few very nice ones have been caught so far and it is only going to get better. I will be offering Smallmouth Bass float trips all summer. These are spin or fly fishing trips. Salmon season dates are almost full if you want to get on the river with me this fall you better call with a deposit very soon. I have September 8th and 9th open. Last year we were getting them up river with no one around on this weekend. This year if they aren’t in the river yet we can troll the lake or fish the estuary in my recently purchased Lund. This boat opens up a lot of options for the early season. These dates won’t last so call soon if you want them. There really isn’t a lot to report other than the fishing is good and getting even better. Everyone is catching fish right now. With a good number of fish left in the hatchery this is going to be an extended season for sure. I believe the colder temperatures have caused the fish to trickle out of the hatchery rather than come in large groups. Add these fish to the fish that spawn in the river and it makes for a great season that will last into mid May for sure. There are also still fish spawning and fish that haven’t started to spawn yet. This past weekend one of my customers caught a dime bright hen that’s eggs were still tight. Check her out on my Facebook or Instagram page. The best baits seem to change from day to day but for me it has been beads and egg sacs over anything else. All fished under a float. The plug bite has been inconsistent with some guys getting them on plugs but most not doing any real numbers yet. With this weeks warmer temperatures I expect the plug bite to really turn on if the water temperature goes over 40 degrees. If you haven’t made it up yet the time is now. I am fully booked with the exception of doing an afternoon trip but I likely can find someone who has an opening if needed. I will be posting a lot more as we transition into summer. Well at least I think we are going to transition into summer. Either way after this weekend it is on to Walleye and Pike then it will be Brook Trout and Black Bass. I still have some openings for the summer trips. I will be offering float trips on the Tug Hill area streams with my new Smith Fly Raft. As I look back on this years salmon season I can’t help but think about how blessed I am to have such great customers. This year was with out a doubt my best year as far as guests go. I sent out a few messages to past customers in August and filled most of my open dates in just a few days. It is a great feeling to have people come back year after year. The remaining dates were filled by September by new customers some of which are now repeat customers as they have already booked future dates. In this business you never know who you are going to get. Every guide has stories of people they couldn’t wait to get off the boat. This year I never had a trip where I felt that way and it was great. We spent the season casting or trolling lures and baits even when others said it was to warm to get them to snap. Day after day we proved them wrong taking plug bites on 70 plus degree days with water temps in the high 60’s. When we got to the ramp we may not have had as many fish on ropes as others but we didn’t snag ours. The only way the snagging mentality is going to change is if it starts with the guides. I know for a fact I changed a few peoples outlook on salmon fishing this season and I am happy I could do that. Overall the Salmon River was crowded most of the season but 99% off the people were friendly and moved out of the way of the boat. There are always going to be the guys who hate the drift boats but I think the number of them is getting smaller. Most people are realizing that it’s not that big of a deal to wait or take a few steps back while the drift boat goes through. They are also realizing that many times the boat gets fish moving around and they hook up right after the boat passes. 2017 Salmon Season was my most fun season by far. The only problem I had was that my son is now old enough to realize that dad is gone all the time. This really hit me hard when he told my mom that dad couldn’t play with him because he works all the time. There will be some changes next fall continuing until the boys are old enough to understand why dad is working 7 days a week for 2 months. I will be running less trips and spending a few more days with family. That being said I have already been booking 2018 salmon trips so if you have dates you want to fish with me I would recommend getting them booked soon. I will be blocking off dates on my calendar on http://www.fisherguiding.com as they are booked if you want to see what is available. This should be done by the end of the week. If you were a guest of mine for the 2017 Salmon Season thank you for making it awesome and I hope to see you again in 2018. It was a cool fall morning when we launched the boats in the dark. This was my first time rowing down the river in the dark and to say I was nervous would be an understatement. I wasn’t going to let me first ever customers know that though. I was lucky enough to have a veteran guide let me follow him down river. We were the first ones in the river so we had our choice of spots. At 5:15 am we dropped anchor at tail of the School House Pool. We only had about a hour and a half to sit in the dark and wait for legal fishing hours. We hadn’t been sitting there 5 minutes when one of my guests cracked his first beer. They had brought a 30 pack with them so this had me concerned. I started rigging up the plug rods we would put out at daylight. Once the plug rods were set I made sure our bottom bouncing rods were ready then I drank my coffee while they drank their beer. When I put out the plug rods at day light there were at least 6 empty beer cans in the bottom of the boat and fish all around us. I was praying we would hit a few fish on the plugs and get them to the net first thing. That was not the case. We had 3 hard hits that doubled the rod over but never hooked up. At that time you couldn’t run bead chains unless you had a special lures permit and being new I didn’t have one. Now it was plenty light out and we could see the fish constantly moving through the current around us. You could also now see at least 10 empty beer cans in the front of the boat. I pulled in the plug rods and hand them the bottom bouncers. I am not going to lie and tell you we were trying to get the fish to bite. We were trying to line them just like almost everyone else on the river at that time. I explained to them how to cast just up stream of the fish so as not to spook them and then drift the line back into them. They kept casting right at the fish. I would tell them to cast ahead of the fish and they would cast way upstream and get snagged. I retied and they cast directly at the fish again. I was in trouble and I knew it. After about 2 hours of this and a few more beers the fish were gone and it was time to pull anchor. When we dropped anchor again there were about 50 in the current right along side the boat. I though we were safe because it was a bit deeper water so they could get away with casting a little too far upstream. They were having trouble seeing the fish so their casts were even farther off target. It seemed no matter what I told them they did the opposite. It wasn’t long before another guide came through saw the fish and purposely splashed his oars through the hole sending them fleeing. I was not happy and never forgot this moment. I didn’t say a word as I was the new guy on the river and I had customers with me. I let them cast for a few more minutes while I regrouped and made a plan. I knew something had to change if I was going to get these guys at least one fish. We made a big move down stream where I could pull plugs in some deeper water. I knew this was our only chance as they were never going to get one casting. We fished through the first hole with out a strike. There were a few shots from a liquor bottle taken though. As I was setting rods in the second hole I noticed there were at least 20 empty beer cans in the bottom of the boat. I could tell the guys were far from sober. The second hole was money or at least it should have been. I watched the right rod double over and saw the fish thrashing on the surface. As I yelled “right rod right rod right rod” I rowed upstream as hard as I could to keep the line tight. Of course both guys tried to grab the left rod. By the time they got to the right rod the fish got slack line and came off. There was only one spot left to try plugging before the boat launch. It was now or never and I was far from optimistic. I put the lures out again and started working them in the current. We were almost to the tail of the pool when the middle rod slammed down into the bow of the boat. I pulled hard on the oars and yelled “middle rod get it and reel”. I told them in the beginning you don’t have to set the hook, the fish will do it for you, just keep the line tight. When he grabbed the rod out of the holder not only did he set the hook like Bill Dance but he dropped the rod right back down giving the fish the slack it needed. The fish was gone and so was all hope of saving the day. Back at the lodge they told a bit different story to the owner who they had booked the trip through. They were not happy to pay all that money and not catch a fish. I was given the chance to tell my side of the story when I stopped in later that evening. I learned a lot in that first trip. First and foremost I needed a special lure permit. Second there would be a limit on how much alcohol was allowed on my boat from there on out. This was when I decided if someone is just looking to catch a buzz they can hire someone else. Today I finally was able to fish one of the Echo rods I purchased a couple months ago. The rod has been fished by multiple customers and I have made some demonstration casts with it but never had time to fish it myself. This morning that changed when I decided to head to the river for a couple hours. As I hiked to a couple holes that I have only fished by drift boat I imeaditly noticed how light it felt to carry. I have it paired with an Echo Ion reel and Airflo line. The rod fished very well. I was casting a 1″ Air Lock indicator four size b split shot and an egg pattern with no problem. I was able to cast overhand, roll cast, and single hand spey cast this rod with no issues. The 10 foot rod makes mending line a breeze. 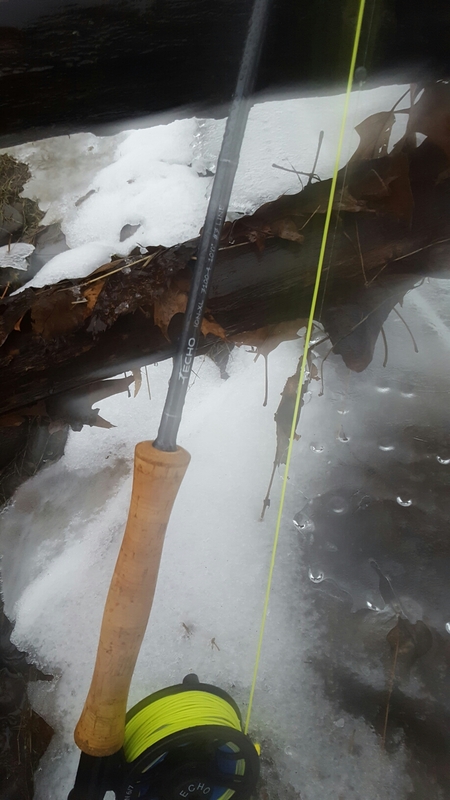 It was a typical steelhead day so I was fishing in rain, sleet, and snow all just two hours. Oh and add wind gusts of 20 mph which made casting tough but the Ion got the job done. Unfortunately I didn’t find a steelhead that wanted what I had to offer so I still haven’t fought a fish on it. However, my customers tell me it handles fish very well. At around $160 I think it’s a top choice for someone who wants a high end performing rod without the high end price tag. Pair it with an Ion reel for another $100 and you have a killer combo for under $300. I had a few free hours this afternoon so I decided to head to the DSR thinking it was the last day my season pass was good. I was wrong it had expired yesterday but summer afternoon rate is only $15 so I bought a pass and headed to the river. The temperature was about 40 degrees and the wind was gusting somewhere in the 30 mph range. Perfect fishing weather, ok maybe not but I had time to fish so that’s what I was going to do. I chose a 9 foot light action spinning rod and a watermelon FLT spinner. After fishing the wall hole and having a small trout get off the hook I decided to walk up to the Little Black Hole. I figured I would fish my way back down. 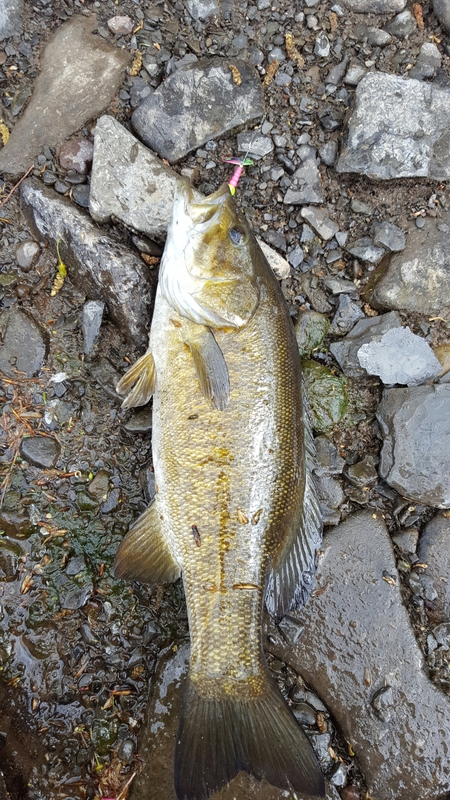 Just below the Little Black I hooked a nice 2 pound smallie that I landed. Then in the Glide I connected with a beautiful dime bright steelhead. Both fish slammed the Finger Lakes Tackle spinner and both fought awesome on the light rod I was using. I continued fishing my way back to the stairs where I stopped to write this report as the sun came back out.